Members and associates of the board meeting in Ohio are (front row, from left) Dale Ulrich (Church of the Brethren), Robert Lehigh (Dunkard Brethren), James Gibbel (Church of the Brethren), and Gary Kochheiser (Conservative Grace Brethren Churches International). Back row (from left) Terry White (Fellowship of Grace Brethren Churches), Michael Miller (Old German Baptist Church, new conference), Jeff Bach (Young Center), Dale Stoffer (The Brethren Church), and David Miller (Old German Baptist Church, old conference). 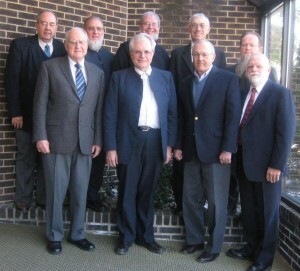 The board of the Brethren Encyclopedia Project is meeting at Ashland (OH) Theological Seminary this Monday, March 4, to firm up final details of the Brethren World Assembly to be held July 11-14, 2013, in Brookville, Ohio. Brethren Encyclopedia is the sponsor of this Fifth Brethren World Assembly, which is being hosted by the Brethren Heritage Center in Brookville. Details on the assembly program and registration are available online at www.brethrenencyclopedia.org.